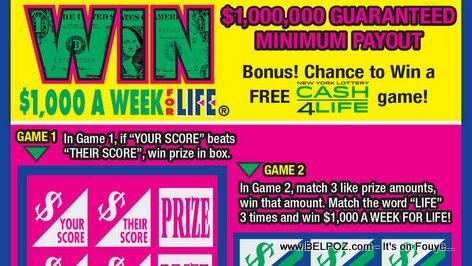 I used to have this routine when the Win For Life scratch off game first came out in New York: I get out of work, I go to the gym, I go to my parents house to eat me some good Haitian food, I go to the the convenient store on Hickory Street in Spring Valley to purchase two Win for Life tickets, then I go home. That day, as I left my mom and dad's house to get into my car, one of the very talkative friends of my dad's stopped me to chit chat. Apparently, the person who bought two Win For Life tickets right before me won. So is this bad luck or did God send my father's idiot friend to keep me busy so the lucky winner could get there first? I am writing this and I have a smile on my face! « What happens when you grow old in Haiti and your children don't want to take care of you? In the world we say lucky but as Christians we say blessed to be a blessing. I felt blessed a lot of times but sometimes things just don't workout or can't work out no matter what and that's maybe because it's not the time yet. 20 years ago I wanted a particular S Class Mercedes Benz with a certain color and interior color but I couldn't afford it and I didn't think there was that combination in existence so I went on forget about it.